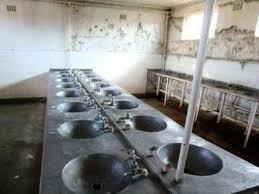 An ablution block at a military base. That South Africa’s top soldier is no fan of the department once known as “government’s landlord” is common knowledge across the defence sector and can be considered a contributing factor to ongoing efforts to make a properly staffed and financed Defence Works Formation reality. This thinking saw Parliament’s Standing Committee on Appropriations (SCOA) visit a number of SA National Defence Force (SANDF) facilities and installations in Bloemfontein recently ahead of a progress report regarding “infrastructure development function transfer” being tabled. In essence the SANDF will become responsible for maintaining its own infrastructure as opposed to it previously being the domain of the Department of Public Works (DPW). General Solly Shoke, currently SANDF Chief and previous SA Army Chief, has long been outspoken about the need for a Works Formation in the South African military. During his time as number one of the landward force (2004 to 2011) and subsequently as the country’s top soldier, Shoke has been outspoken about the need for soldiers to look after and maintain the infrastructure and facilities they use. This saw refurbishment work done at messes and other military facilities in Thaba Tshwane as well as a military hospice built at Lenz, south of Johannesburg by what was then the SA Army Works Formation. Since then numerous other refurbishment, upgrading and smaller building projects have been successfully completed. Now the Works Formation concept as a national defence force component is gaining momentum. It is based on, among others, the reactive maintenance and repair strategy used by DPW. This has seen, as examples, a leaking roof or burst water pipe having to be outsourced for repair at high cost or neglected to the extent an entire property needs major repairs as a result of what was initially only secondary damage. As part of the Department of Defence Logistics Division, headed by Major General Mogorosi Ledwaba, the envisaged Works Formation will have qualified professional personnel in the building, civil engineering and construction disciplines once fully operational. In the longer term the Works Formation would be responsible for designing a proactive total facility maintenance strategy. This would minimise deterioration of existing facilities as well as outsource and oversee construction tenders for, among others, new living quarters for soldiers. In the short term the Works Formation will take over and complete work in and around Bloemfontein using funds from the Defence Facilities operating budget. In his progress report to the Parliamentary committee Ledwaba notes “it will take just a minimum of money for human resources and operating budgets to make all DoD facilities comply with occupational health and safety standards as well as saving a substantial amount of money”. He warns if the status quo as far as facilities is left “unattended, it will contribute to further depletion of the DoD budget and compromise the mandate of the SANDF to keep the country secure”.